Getting through airport customs at Bolivian airports doesn't have to be a stressful experience if you are fully informed about which items you are allowed to bring into the country and which are prohibited; on which items you will pay tax and which you may bring in duty free or tax free; how the airport customs system works; and, what customs officials will look for, ask you about, or ask that you present to them. The following tips should facilitate clearing airport customs. Questions? Visit our Bolivia Travel Forums. Many foreigners have asked us which personal items (and how many) may be brought into Bolivia when entering the country through an airport. 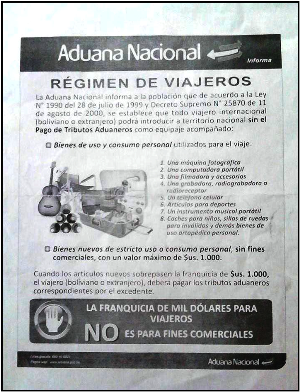 The Bolivian Immigration Service has printed a flyer indicating which items you may bring with you, either as carry-on items or in your luggage, which would be considered items for personal use (items to be used while you travel that are not for commercial use or resale), and therefore would not be taxed upon entry. These are personal items you may bring with you on your flight and does not refer to household belongings shipped into the country separately. Plus, new items strictly for personal use or consumption, the value of which does not exceed a maximum of $1000 (one thousand U.S. dollars). When the value of new articles brought into the country exceeds the maximum of $1000 (one thousand U.S. dollars), the traveler (whether he/she be Bolivian or a foreigner) must pay customs taxes on the remaining value (amount) over $1000. Their flyer reiterates: The $1000 (one thousand dollar) value on items with which travelers are allowed to enter, must NOT be for commercial use. Be forewarned about gift items you may bring into Bolivia. On 30 October 2013, Marlene Ardaya (head of Aduanas, Bolivia's Customs Service) confirmed that items you bring into the country to give away as gifts to someone else do NOT count as 'items for personal use'. Therefore, any gifts you bring will be taxed, even though they are not for resale. If you have questions about immigration or customs, you can visit the websites of the Bolivian Customs Service (Aduana Nacional) or the Bolivian Immigration Service (Dirección General de Migración). If you are considering moving to Bolivia, and have questions about applying for residency, importing household belongings, living, retiring or working in Bolivia, consider contacting Bolivia Expat Services for assistance. 1. An airport exit tax called the ISAE (Impuesto a las Salidas Aéreas al Exterior) is assessed on international flights when you leave Bolivia. This tax is charged only at the international airports. For 2015 the ISAE tax is Bs. 296 (approximately $43). Prior to March 3, 2014, this tax was paid at the airports; however, on this date, the Bolivian National Tax Service passed Resolution No. 10-0037-13 ordering that the ISAE tax must be included in the price of all tickets purchased electronically or from travel agencies, and therefore will no longer be paid at the airports. 2. An airport usage fee of Bs. 15 is also assessed on all flights, incoming and outgoing, national and international, and at all airports. 3. Foreigners with residency in Bolivia will be assessed an additional foreign resident exit tax of about Bs.100 (approximately $15). This tax is collected by Bolivian customs agents as you pass through the security section on the way to the departure gates. Be forewarned that the price of this tax seems to vacillate between Bs. 100 and Bs. 150, depending on the foreigners with whom you speak. Everyone seems to have a different experience with this tax. This website has been unable to locate or identify which Bolivian law or resolution covers this tax.